I was so excited to see this new product because it’s sized for a 9×13 casserole and can go from oven to crock. That means that aside from cooking in the slow-cooker, you can bake up a casserole and keep it toasty warm when serving in your own home, Or pop on the lid and pop out the handles to carry it to a friend’s house. 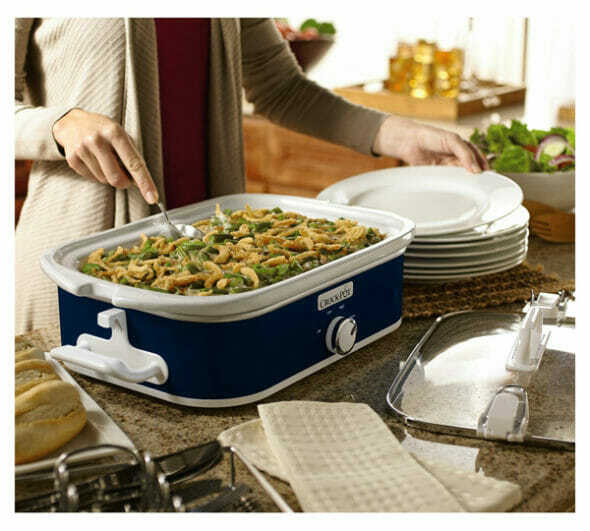 The Crock-Pot® Casserole Crock™ Slow Cooker makes family dinners, potlucks and parties easier than ever. Its rectangular design is the perfect size and shape to prepare everyone’s favorite casserole dishes, lasagna, desserts and more. It’s ideal for make-ahead meals you and your family can come home to, simplifying mealtime. The unique stoneware is also oven-safe for use in conventional ovens to cook and warm. With portability in mind, the Casserole Crock uses our Cook & Carry locking lid system for easy transport, without spills or mess. It also makes entertaining easy so you can prepare a casserole or dish in advance, then let it slow cook. You can enjoy your guests or get to other party preparations. When your kitchen oven is working on overload, the Crock-Pot® Casserole Crock is a lifesaver by freeing up space in the oven. This month is CROCKTOBER, and every week Crock-Pot® Slow Cooker will be giving people a chance to win a new prize! Go HERE to enter, and visit theCrock-Pot® Slow Cooker Facebook page to figure out how to unlock additional prizes and increase your chances of winning! Today, we’re also giving away a Crock-Pot® Casserole Crock Slow Cooker here on Our Best Bites- Enter using the form below to win! Sweet Potato Turkey Chili . . . there may be a chipotle in there or something, too. Mmmm . . . I love putting your Dressed Up Sloppy Joes in my slow cooker. Love this new product. It’s so cute! Sweet potato turkey chili for sure!! chicken & dumplings! 🙂 thanks for the giveaway! Fauxtisserie Chicken! Though I need to try that chocolate pudding cake one of these days! I haven’t tried any of your slow cooker recipes, but I have been eyeing the ratatouille and apple cinnamon oatmeal. Slow cooker chocolate pudding cake. Fauxtisserie Chicken. Clean plates and no complaints. I love slow cooker taco chicken. I love the Slow Cooker Gooey Chocolate Pudding Cake… I just can’t have it in my house because I can’t stop eating it! We love the dressed up sloppy joes in the slow cooker! We’ll be serving your slow cooker taco chicken at my daughter’s baptism luncheon next week. Yum! My favorite slow cooker recipe from My BEst Bites is Slow Cooker Kalua pork! I like chicken cacciatore, but the saucy hot dogs recently became a hit with all our friends. For me the crock pot means comfort food, and comfort food means chicken and dumplings. I haven’t tried any recipes yet, but I’m almost positive i pin about every other one to try in the future. Just need to dig them out of the depths of the internet again! Slow cooker taco chicken is a huge hit at our house, in tacos, quesadillas, burritos, you name it! dressed up sloppy joes are my favorite! Slow cooker taco chicken!! I’ve really been wanting to try the chicken enchilada soup in the slow cooker – hopefully that will happen this winter! Overnight apple cinnamon oatmeal is my favorite, my daughters beg me to make it so I end up looking like the great cook. I did the taco soup in the slow cooker, it was delicious! White beans with rosemary. Yum! Slow cooker Kalua pork. It is so tender and yummy and can be used so many ways. Love it!! the roast with pepperoncinis! made into sandwiches. Oh my goodness so delicious! I really want to try the Kahlua Pork, it sounds amazing! SLOW COOKER CHOCOLATE PUDDING CAKE!!! Fauxtisserie chicken without a doubt. But looking through the index I noticed several others I’d like to try. Who would ever have thought that a crock pot would be described as “cute” and yet there’s no better word for the one you showed that you have. Stew. As soon as the weather starts turning cool, I crave stew! Sweet potato turkey chili. Yum! I do the Kahlua pork in the crock pot. Love the slow cooker black beans recipe! The chocolate cake for sure!!! We love your Fauxtisserie Chicken!!! Slow Cooker Taco Chicken is the only one I have tried so far, but have so many on my list to try. Do I “have” to pick just one? It’s a toss-up between your French Dip Sandwich and Cranberry & Cola Glazed Ribs. Both are so delicious! I just took a peek at your Slow Cooker section and realized how many more I have to try! Love this giveaway! I haven’t tried any of your slow cooker recipes yet, but I am sure I will in the coming weeks since I have fallen BACK in love with slow cooking recently. It’s just SO easy! Definitely the Rosemary and white beans. I just made it again yesterday. So simple, so delicious. I love it! I haven’t tried any of your slow cooker recipes yet but this would help me get started! I see a lot of people raving over the fauxtisserie chicken–I’d love to try it. I LOVE your BBQ pulled pork! I think my favorite is the Hawaiian-Style Sloppy Joes, but you have so many that taste great. Chicken taco thing – WE LOVE IT and make it at least once a month. Great job! Slow cooker taco chicken- love! And I add whatever veggies I need to use up. I absolutely love the slow cooker french dip sandwiches! My favorite OBB slow cooker recipe by far is the Kalua pork! I love making your Black Bean and Sweet Potato Turkey Chili. Yum!! I love the overnight oatmeal! I always do the while chicken chili in the crock pot and we love it. We also like the black beans. My favorite slow cooker recipe is French Dip Sandwiches! Delicious!! One of my favorite slow-cooker recipes from your blog is the Slow-Cooker taco chicken. I made it for my family when they came over and they LOVED it!! I love your french dip recipe! We love the French dip beef sandwich recipe and make it over and over and over again! My family is in love with the Kalua Pork slow cooker recipe! I love the chicken enchilada soup! We love your Kalua Pork recipe at this house:) What a fun giveaway thanks for the chance! oh, the french dip sandwiches! so very delicious! Fauxtisserie Chicken – so good! We love Whitty Baked Beans! It only takes an hour to bring all the flavors together and it’s so good on cold fall days! Sorry I read it wrong! I love your sweet and sour meatballs! Chicken taco. It is a family hit. I love your French Dip recipe. I’m pretty sure it was your first recipe I tried at least 5 years ago! French dip sandwiches is a favorite, as well as the taco chicken. Yum! I love your French Dip Sandwiches! I love the sweet potato and turkey chili! And I also love the taco chicken! We use crockpot for refried beans (and cooking other dried beans)–they’re so easy and everyone in our house loves them. Thanks! Most of your chicken crock pot recipes are great! Can’t pick just one! Indian spiced lentils fer sure! I haven’t tried any of your crock pot recipes, but I have a crock pot chicken stew that my family loves! I’ve recently discovered your baby back ribs recipe for the crock pot and I LOVE it!! You French Dip Sandwiches… Or the Ratatouille. We make both of them ALL the time. Baby Back Ribs. definitely a family favorite. We adore your Black Bean and Sweet Potato Turkey Chili. We eat it just about every other week! I love the slow cooker taco chicken. Slow cooker black beans…so much easier than stove top! I love both the Kahlua pork and the slow-cooker French Dip Sandwiches–it’s a tie! My favorite OBB slow cooker recipe is the Hawaiian Sloppy Joes with the overnight apple cinnamon oatmeal coming in 2nd. I haven’t tried any slow cooker recipes from OBB yet, but I’ve been meaning to try the Kalua Pork for a long time, I need to get on that! I love love love the Kahlua pork! Fauxtissary Chicken and dressed up Sloppy Joes! The french dip sandwiches are my favorite! Fauxtisserie Chicken! It’s SO easy and delicious! My daughter or I make your slow cooker black beans regularly. Overnight apple cinnamon oatmeal, please! Chocolate Chicken Pot Pie – it’s a mole’ style chicken, but chocolate for dinner sounds more fun! Your French Dip recipe. I can’t get enough! Black Bean sweet potato turkey chili all the way! It feels so healthy and tastes so stinkin’ good!!! I love Slow cooker Enchilada Soup. My favorite OBB slow cooker recipe is Lasagna Soup! SO SO Good! Thanks for the giveaway. I love your black bean sweet potato turkey chili! Love the OBB French Dip slow cooker recipe!! LOVE the turkey sweet potato chili!!! I’ve actually never tried any of the slow cooker recipes specifically from here, but, looking through them, the kalua pork is making my mouth water and I have my own refried beans and black bean & sweet potato chili recipes I’ve been using for years. Slowcooker Chocolate Pudding Cake looks amazing and I can’t wait to try it. I love the slow cooker taco chicken, but I’m trying the ratitouille today! Smells heavenly! I don’t believe I’ve tried any of your slow-cooker recipes. I’m going to have to look into that. I love the enchilada soup in the slow cooker! I love Chicken Enchilada Soup! I have to say that my family and I looovvvveee your french dip recipe! I have used it a lot, even for big events like my daughter’s high school graduation dinner for family and friends. It is always a big hit! I love how easy it is to make using the crock pot too. You guys have been a meal lifesaver time and time again! Thanks! Baby back ribs are a favorite at our house! my family LOVES chicken enchilada soup! This is totally boring, but I make your black beans more often than anything else in my slow cooker! SWEET!!! My Crock Pot broke a couple weeks ago and I’m trying to decide on how to replace it so this would help so much! I’m a big fan of cooking chicken breasts, taco chicken and chicken enchilada soup! Yummm!! I love to make your White Chicken Chili and keep it warm in the crock pot! Love the “cafe rio” crock pot recipes! I love your recipe for French Dip Sandwiches! Chicken Enchilada Soup – YUM! The summer veggie ratatouille, mmmm love those summer veggies! Great giveaway! Love you guys! We love the chicken enchilada soup and anything cafe rio! I’ll be honest and say I’ve never actually made any of the crock pot recipes but maybe if I won I would! So many good recipes-red beans and rice or kahlua pork are made frequently. We will need more casserole recipes to go with the new crock!! My picky kiddos love the taco chicken! I love the Pepperoncini Beef Sandwiches!!! So yummy! Sweet and Tangy Brisket is my fave OBB crock pot recipe! Pepperoncini beef changed my life! Love your black bean sweet potato turkey chili! Taco chicken is our favorite!! I honestly love them ALL! But probably the french dip sandwiches! 🙂 love love love this crock pot! My favorite is the slow cooker taco chicken! I can use it for three dinners! Tacos the first night with fresh pico de gallo. Then I use the chicken in quesadillas the next night. And then the third night I use the leftover chicken and pico on a Southwestern pizza with black beans, corn and lots of cheese! Yum! Chicken cacciatore! Love it–sooo good. I need to make it again soon! I like your version of the Slow Cooker Kalua Pork. Had searched around for a recipe for the pork & this is the one I go to now for good results. It’s totally the garlic lime chipotle roast chicken. LOVE it!!! I would like to try the Fauxtisserie chicken one day if I’m ever brave enough to deal with a whole chicken! Hands-down it is Kahlúa pig! I haven’t tried any yet, but plan to as soon as the weather cools down where I live. My favorite slow cooker recipe is the taco soup! There are a lot of crazy taco soup recipes out there, and this one is simple and delicious! I haven’t tried your slow cooker recipes yet, but I am itching to give the saucy hot dogs a whirl. Maybe for Halloween? I love to make your Kahlua pork. All 5 of my kids love it as well. So its a win win!! Sweet potato turkey chili is my family’s favorite. Even my sweet-potato-hater-husband demolishes it. Ha! I’ve made your kalua pork in the crockpot a couple of times and I love it–so simple and yet so delicious. We love making your Coca Cola cranberry ribs in the crockpot! Sunday Beef Stew for sure!! The black beans…easy and delish! The French dip sandwiches! I make them a lot for company and someone always asks for the recipe! It’s a toss up between Taco Chicken and Kalua Pork! YUM! I haven’t tried any of your slow cooker recipes, however they all look so yummy. Time to add a few to our menu! I don’t use my slow cooker much, but I loved your Pepperoncini Beef Sandwiches! Taco chicken, French dips… It’s all so good! Kalua Pork and French Dips! Sweet potato turkey chili and pulled pork! Crockpot season is here and chicken tacos are on the menu tonight. Love your recipe, as always! The French Dip sandwich recipe is my favorite in the crock pot! I love french dip sandwiches and your freezer meal pulled pork. The slow cooker chocolate pudding cake is a winner every time we have guests!! French dip sandwiches are staple around here! Hands down Kalua pork! We lived in Hawaii for a few years and I always make this and put on some Hawaiian music when we’re missing the islands! Chicken and dressing by far my favorite! There is a chocolate cake I love. I’ve tried many of your recipes, but not a crock-pot one yet. But I am looking for new ones and there are so many I want to try! The slow-cooker kalua pork looks amazing! My favorite is the pulled pork! Taco Chicken!! Yum Yum Yum!! Taco chicken!! Just made it last week, so yummy!! Gotta be the Black Bean and Sweet Potato Turkey Chili! I get asked for the recipe all the time. Super cute crockpot and I am shopping around for a new one. Oh please random contest picker gods, pick me! Slow Cooker Taco Chicken is my favorite OBB slow cooker recipe. My favorite recipe is the French Dip Sandwiches! I love the Slow Cooker Taco Chicken — so easy! The slow cooker Chocolate Pudding Cake is my most recent obsession from your blog! And thanks for the generous giveaway opportunity! BBQ pulled pork for sure! Fauxtisserie Chicken, it really works and tastes so good! Refried beans! Great to freeze and use as a side. I love cooking in a crockpot! I love, love, love the slow cooker taco chicken. It’s so easy, and so flavorful!! Pot roast in the crock pot is about the best thing ever. I love the chicken enchilada soup, but I’m dying to try the Chocolate pudding cake! I’ll be honest, I have never done one of your CROCKPOT recipes…but I love you guys! And I am interested in getting into crockpot cooking – just looked through all your delicious-looking crockpot recipes and I am going to try the chicken enchilada soup! Slow-Cooker Ratatouille is my favorite. French dip sandwiches for sure! Love the taco chicken, chicken tortilla soup, french dip sandwiches, chocolate pudding cake. To name a few!! I’m thinking I want to try your split pea crock pot recipe! It may be my new favorite. I’ve never tried this before but I am a fan of split pea soup…also a really good memory from my childhood when I went to my great-grandmother’s house…it was raining and she made split pea soup. It’s still one of my favorites today and I think that was the first time I had ever tried it. She had a tall red shiny apple red vinyl stool and little jam jars shaped like seahorses that we used for drinking glasses. Pepperoncini Beef Sandwiches! Yum Yum! I’m going to go with Fauxtisserie Chicken. The sweet and sour meatballs! I haven’t tried your slow cooker recipes, I need that slow cooker, but the chicken taco sounds wonderful. The Apple Cinnamon Overnight Oatmeal is the best in the the slow cooker. I love to make your White Chicken Chili in the Crock-Pot. Fauxtisserie chicken! I make it at least once a week and use any leftovers to make Creamy Chicken Taquitos!! Bbq pulled pork! And i seriously dropped my slow cooker pot this morning and it shattered! It was very very sad! The overnight oatmeal is one of my favorite dishes! We just have to modify for mine and my daughter’s food allergies. This would definitely help! I’d say it’s a tie between the black beans and the overnight oatmeal! Yum! Kahlua Pork is my favorite slow-cooker recipe from Our Best Bites! It always reminds me of Hawaii!!! I like to do the lasagna soup! The turkey chili for sure! I love making OBB’s recipe for French Dip sandwiches. We make them all the time! Overnight Apple-Cinnamon Oatmeal is my favorite Our Best Bites Slow Cooker recipe. I LOVE having breakfast ready when I get up. Makes school mornings so much easier! I love the slow cooker black beans! Crock pot pulled chicken with black beans and rice. Or crock pot homemade chicken Alfredo. Really, the possibilities are endless. Love crock pot recipes, yuuuum! Love your French dip sandwiches!!! My favorite is the Sunday beef stew!! Throw it in and forget it! Crock pot pulled chicken with black beans and rice, or crock pot homemade chicken alfredo. Really, the possibilities are endless. I love crock pot recipes, yuuuuum!! My family goes crazy for the beef pepperocini sandwiches. There are 7 of us, and everyone fights over the leftovers! My favorite is easily the black bean sweet potato turkey chili… I love that it tastes even better the next day and makes so much to have plenty of leftovers! *I have to also say that I’ve dubbed this as “Thanksgiving” chili when telling my husband I’m making it! While I make the fauxtisserie chicken all the time, my absolute favorite is the sweet mexican pulled pork recipe… mmm! The BBQ Pulled Pork for sandwiches in a slow cooker is my family’s favorite! Fauxtisserie chicken, it’s a hit at our house! White chicken chili and also beef roast with vegetables ( a tie!). Hawaiian Crockpot Chicken. I could eat it all day, every day! Taco chicken for sure. My daughters and I both love it! French dip and sweet potato turkey chili are my favorite! The beef pepperoncini if my family’s FAVORITE!! I have never made one of your Crock Pot recipes, but have LOVED all your recipes I have tried! And I’m pretty stoked about this prize! I love your slow cocker Taco chicken. It is a favorite at my house. Taco chicken is a favorite at my house! Fauxtisserie chicken and the taco chicken. I am definitely welcoming crock pot season–busy busy fall!! Love all your recipes! Chicken taco – first! Our family favorite is taco chicken! One of my favorite slow cooker recipes is the kalua pork. 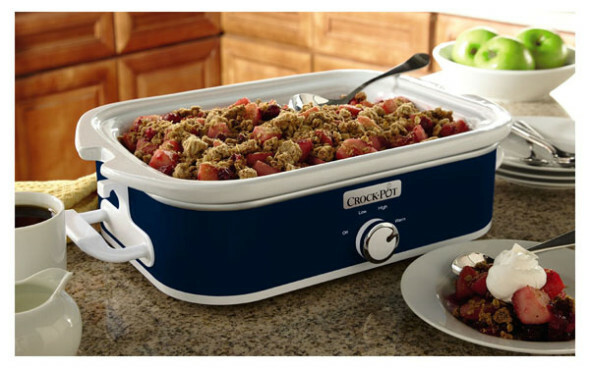 I would love to win one of these casserole crocks! I just had twin girls on Sunday and this would make dinner so much easier! The kalua pork sliders are so yummy. We hosted a luau at our home and this was a big hit. Love the BBQ pulled pork sandwiches! Served them to my family for Easter lunch this year instead of traditional ham! I would love to make your butternut squash soup in the slow cooker! French dip sandwiches made in the slow cooker are the best. I love this new slow cooker! I can think of all kinds of ways to use it for my family of six! Thanks for the chance to win an awesome prize! I looked over the list of your slow cooker recipes and I was shocked to realize I haven’t tried any of them! I’ve made so many of your recipes (I know I can count on a winner every time! ), but not from that category. So the Fauxtisserie Chicken and French Dip will be among the first I will try! My favorite is the Creamy Cajun Pasta with Smoked Sausage and Peppers. Thank you for the wonderful giveaway. I love the sweet & sour meatballs. So easy and so tasty! I just made a lasagne recipe with homemade basil, tomato, & spinach sauce – delicious! French Dip sandwiches are so-o-o easy, and yummy. Personally, the pepperoncini recipe is even yummier, but for whole-family-easy-meal, definitely french dip. I LOVE the slow cooker refried beans. My favorite slow cooker recipe from you is your Kalua Pork. The Fauxtisserie Chicken is one of our fav’s. Love the slow cooker chocolate pudding cake. A mashup of the pepperoncini beef & french dip sandiwches = our italian beef! My husband and kids go crazy for the kalua pork!! Pepperoncini Beef. My family loves it and I love how tender the beef gets. I love the version for the cafe rio pork!!! Taco chicken is a keeper at our house! Chocolate pudding cake – makes enough for a crowd – so great to take to a church or work potluck! I definitely didn’t have to think to hard about this question. It’s definitely Kalua Pork. Italian Chicken with Rice or Salsa Verde Chicken or Pepperoncini Beef. I could go on and on! French dip sandwiches – yum!! I think the fauxtisserie chicken and kahlua pork are neck and neck. Of course, all of your stuff is so good, it’s really hard to choose. Love the look of this crockpot, I’m thinking mardi gras chicken would cook wonderfully in there. We love the French dip sandwiches. I haven’t done any crockpot cooking, but looking forward to trying a bunch of your recipes! slow cooker refried beans are one of my favorite slow cooker recipes on the site. This might be fudging it a little, but I love doing your spaghetti and meatballs in the crockpot. Everyday Chili from your second cookbook is another slow-cooker favorite. The Chocolate Pudding Cake is the most popular one by far. Other recipes I make appeal to different family members and friends but they are unanimous in asking for the pudding cake. I just made the Indian Spiced Lentils for the first time and my familly loved it 🙂 YUM! I love the slow cooler taco chicken! I would say the French dip sandwiches. Slow Cooker Caramelized Onions is the BOMB in a slow cooker!! Place sliced onions in slow cooker with oil and salt Stir to coat. Cook in slow cooker on low for about 10 hours or until they reach the stage of caramelization you like. I start them braised Italian chicken on the stovetop, then put it all in a crock pot to simmer. Love it! I love to make refried beans in the slow cooker, they taste so much better than buying canned beans from the store. I make the Chipotle Chocolate Chili all the time during the fall and winter! Thanks for the chance to win! My favorite is Slow Cooker Refried Beans – so handy to have on hand ’cause they’re so versatile! I make your Fauxtisserie chicken all the time. It’s on my menu for this week! Thanks for the great giveaway! Red beans and rice! Mmmmmm! Black Bean and Sweet Potato Chili…perfect for this time of year! I made the crock pot chocolate pudding cake recipe a few weeks ago, and my boyfriend and I loved it! Such an easy way to get dessert on the table. I love the taco chicken! Kalua pork! Made it tonight. We love your slow cooker Indian Lentils! Your Fauxtisserie Chicken Breasts (and Fauxtisserie Chicken) are brilliant! Thank you for the giveaway! I love the taco chicken, and right now I love to make black bean soup in the crock pot. Its one of the few soups I can have with gestational diabetes. I love crock pot cooking – and this is the cutest, most versatile design crock pot ever! Love making turkey chile – mmm mmm good! It has to be the chocolate pudding cake…with ice cream or whipped cream on top…YUM!! Beef tips and mushrooms slow cooked in cream of mushroom soup. Soup turns into a dark brown gravy and served over rice or mashed potatoes. So good! Southwest Beef. We put it in tacos or serve it with rice. It makes lots so I always freeze some for later meals. Plus it’s really easy and delicious. Love the overnight apple cinnamon oatmeal! YUMMY! Red beans and rice from your first cookbook. Yum! I really like your slow cooker taco chicken. Delish! Love to make the Split Pea Soup with Ham. Easy, delicious and perfect for cool evenings! Thank you! Taco Chicken is my favorite slow cooker recipe! We make it all the time. Fave slow cooker from Our Best Bites is the French Dip sandwiches. Heaven. I love your quick meatballs with the chili sauce and grape jam. So easy and everyone always loves them! I’ve made the Fauxtisserie Chicken many times. Thanks! I have to pick one…..
Peppercini Beef Sandwiches from the Savoring the Seasons cookbook. You can’t find an easier recipe that smells and tastes so good. The French dip sandwiches are always a favorite at my house! Love them!! I don’t have a true favorite yet, but I want to try the slow cooker ratatouille. Slow cooker chocolate pudding cake! Love your slow cooker French dip sandwiches! Slow cooker chocolate pudding cake. I’m a sucker for sweets! One of my favorite slow cooker recipes (there are so many!) is the French-Dip Sandwiches. So delicious, and so so easy. The hawaiian style sloppy joes. I like the chicken enchilada soup. I just hope it finally cools down in Texas. It was 98* yesterday. My Favorite recipe has to be retried beans. Healthy and super cheap! Oh and easy! I like the chicken enchilada soup. My family enjoys having your slow cooker taco chicken once a month during our Tuesday Mexican dinner nights. Great recipe! French Dip sandwiches are my favorite! Definitely the Black Bean Pumpkin Chili. Love!! Your fauxtisserie chicken is my favorite! I love the Fauxtisserie chicken recipe. Slow Cooker Chicken Taco recipe is great….All the recipes I have tried from your blog ae wonderful. Thanks for sharing them and with the fun insructions too!!! My family loves the Taco Soup! I love the sweet pork and French dip!! This crockpot is amazing! I had’t seen one before! I love any meals out of the crockpot! Favorite crock pot recipe- slow cooker French dips. So yummy! I haven’t tried it yet, but I have your slow cooker chocolate pudding cake bookmarked and need to make it ASAP! Taco chicken. I also love pork tenderloin in the crock pot! my favorite slow cooker recipe is the Fauxtisserie Chicken. I love the taco chicken! Make it on a regular basis. Yum! I’m so glad you posted this giveaway because I had no idea that you guys had so many slow cooker recipes. Through this, I discovered the option to sort your recipes by cooking method and now it’s like a whole new website all over again! I LOVE using my slow cooker and I’m excited to have a new recipe source. After a quick scan, the Indian Spiced Lentils sound like something that’s right up my alley! Your Black Bean and Sweet Potato Turkey Chili sounds perfect right now. My absolute favorite is the slow cooker vegetable ratatouille. So delicious! Dressed up Sloppy Joes are always welcomed at our table! We love the pepperoncini beef sandwiches and the Kayla pork. I love the white chicken chili soup from your first cookbook! Taco chicken..so easy and yummy! Your dip sandwiches. So yummy! Pepperoncini Beef Sandwiches. It’s my husband and oldest son’s favorite, too. I just love taco chicken and recently prepared it for a birthday luncheon for my stepdaughter whose oven was broken. The taco chicken was a big hit. Thanks for all the great recipes. I am obsessed with Beef Stew!! Love White Chicken Chili, Taco Chicken & Chocolate Pudding Cake. Yum! Your French Dip sandwiches and Dressed-Up Sloppy Joes are two of our favorites! I love the fautisserie chicken – I use it all the time! French dip sandwiches! Or maybe the sweet potato turkey chili…or maybe the dressed up sloppy joes…how do I choose! My girls love sweet and sour meatballs!! I love the easiness! 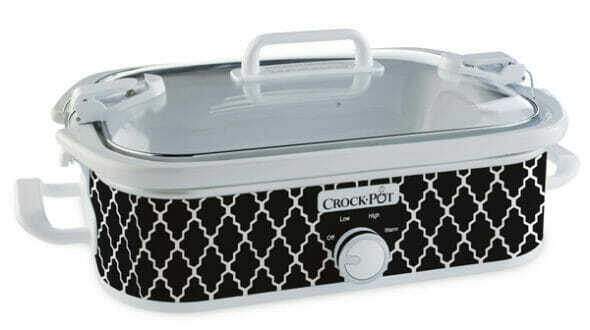 I love my crockpot, but sure isn’t as pretty as this new line! Slow cooker overnight apple oatmeal! The Kalua Pork!! We make it for E.V.E.R.Y.T.H.I.N.G. So good!! There are so many great slow-cooker recipes here…kalua pork…sloppy joes…Sunday beef stew, these are some of my favorites. Kalua pork but all of your recipes I’ve tried are amazing. I’m never scared to try something from your website or cookbook. French Dip sandwiches and Taco Chicken. Thanks! Slow cooker taco chicken- we love it and I make it at least once every two weeks! Fauxtisserie Chicken, I might need to go make that for tonight now, yum. taco chicken! So many ways to use it. We love anything Mexican, so Taco Chicken is our favorite! Slow cooker chocolate cake – YUM!! My favorite obb crockpot recipe is French dips. hands down favorite at my house. Now if beef wan’t so dang expensive lately!! We love the slow cooker taco chicken. So good mixed with your pico de gallo! For sure the Sweet Potato Turkey Chili!!! My whole family loves the french dip! The French dip sandwiches is my favorite slow cooker recipe. Italian Turkey stew…yum, yum, yum! I should have been born Italian~ I can’t get enough of Italian food! I can’t wait to try the chocolate pudding cake recipe, but I have tried and loved the chicken & dumplings! I think the only slow-cooker recipe from you I have tried is your Rosemary White Beans. They are delicious. I will have to try some new recipes because I’ve never made anything of yours that I just didn’t like. Love Chocolate Pudding cake. This Casserole Crockpot, what a great idea! I love the cheesesteak recipe! My family went crazy for them! My family loves slow cooker taco chicken! And this crockpot looks fantastic! Kalua pork, French dips (with pepperoncinis) so many!!! Thanks! We love the taco chicken! I love the sweet and sour meatballs. What I consider your taco chicken. I will cook up a whole batch, shred and freeze for various meals. I am not sure if that is the real name of it though. I love the creamy chicken taquitos. I love the summer vegetable stew… It’s amazing! I love your red beans and rice recipe! Smokey Bean Soup with Ham and Bacon is one of my favorites, I also like chicken and biscuits. I just made the crock pot taco chicken and LOVED it!! The chicken was super moist and now I get to use the leftovers to make the creamy chicken taquitos! I love your Slow Cooker Taco Chicken! And can’t wait to try your Slow Cooker Chicken Enchilada Soup! You guys are the best! Thanks for the opportunity! Baby back ribs or the spaghetti sauce and meatballs done in the crock pot……can’t really choose, they’re both favorites for this family! Taco chicken is the best! My favorite is taco chicken! Mm! Babyback ribs!! I love this new crock pot! I use my crock pot all.the.time! Minestrone Soup! Yummky!! Wow, I love that Crockpot! French dip sandwiches, kahlua pork, and sweet potato turkey chili. So yum!! So many, but off the top of my head: pao de queijo, chipotle chocolate chili, and the amazing carrot cake. I’ve been wanting to make the chocolate pudding cake in the slow cooker. Looks fabulous! I like the refried beans in the crock pot! I love the slow-cooker Kalua Pork! Yum! I use your slow cooker black beans a lot. And the Kalua Pork? YUMMY! What a cool crock pot by the way! Pepperoncini beef sandwiches! My mouth is watering thinking about them!! the slow cooker chocolate pudding cake. So yum. Southwestern beef wraps! Sometimes we do Chicken instead! How to make the christmas gifts of homemade vanilla. I did it last year! We love salsa chicken, barbecue chicken, pulled pork, and angel chicken. I love the slow cooker chocolate pudding cake. Garlic Lime Chipotle Roasted Chicken. I haven’t tried any yet but I can’t wait to try some once the Texas heat cools down- chicken enchilada soup sounds great! We love your, Split Pea Soup in our Crock Pot. It’s Heavenly! Oooohh. Kahlua pork is the best!! It’s so easy to prep it in the morning and it smells so good all day long as it cooks!! I’m actually trying the fauxtisserie chicken tomorrow! Overnight apple cinnamon oatmeal is easy and delicious. It’s my favorite! Sloppy Joe’s are always a favorite! I love the taco chicken from OBB! Ooooh I love this, my favorite is your Sunday beef Stew. cant wait to try your chocolate pudding cake! I’ve been dreaming about it for weeks now. I love the Kalua Pork!! I’ve done the Kalua pork in my slow cooker a few times and loved it. I love the fauxtisserie chicken! But now I’m thinking of all my favorite casseroles that would be fun to make in this bad-boy! Slow Cooker Taco Chicken! So easy, but soooo yummy. I like the chicken dumplings. I actually haven’t tried any OBB crock pot (slow cooker) recipes. I think all I’ve ever cooked in a crock pot is a roast, or kept cranberry orange cocktail meatballs warm in it for holiday parties. I did see an actual more-than-dumping-one-thing-in-it recipe on the internet somewhere (probably pinterest or maybe fb) that piqued my interest recently, though. It was a crock pot lasagne recipe, and this 9×13 slow cooker would be PERFECT for trying that out! I have a recipe for Costa Vida chicken that’s so simple! I love crockpots –especially in the summer when I don’t want to turn on the oven or cook over a hot stove. This would be awesome to be able to brown a crispy top on something in the oven really fast after it cooked all day in the crockpot though. I know it’s pretty new, but I loved the chocolate cake you made in the slow cooker. I’ve made some versions before, but really liked yours. So did everyone else who got to sample it. The split pea soup! GreAT. thanks for all the great recipes! That Taco Chicken looks awesome! It’s not specifically a slow cooker recipe, but I do the white chicken chili in the crock pot a lot. Indian Spiced Lentils! Make it at least once a month. French Dip Sandwiches – just made them for company last week! I love the chicken taco recipe…we are taco fans and having something in the crock-pot is so handy for spending a minimal time in the kitchen. Thanks. Our all time favorite is your French dip sandwiches recipe in the slow cooker!! We LOVE the Kalua pork!! I LOVE your halloween chili dogs. They are perfect! I love the Turkey Pumpkin Chili with it’s unique combinations. I mean there’s chocolate in my dinner, what could be better. French dip sandwiches. My kids cheer! Dressed up sloppy joes would be perfect for this! The chocolate pudding cake of course! Chicken enchilada soup and tortilla soup!! Love these! French dip sandwiches!! And Kalua Pork! Sweet potato turkey chili! I anxiously await the cold weather each year just to eat it! Then we have it once a week for the whole season! Love the slower cooked french dip. So yummy. My favorite slow cooker recipe from this site is the fauxtisserie chicken! I love to make your sweet and sour meatballs in my slow cooker for when I have a gathering. So easy and everyone loves them! Babyback ribs glazed with cranberry and coke… Yum!!! I love the pepperocini beef sandwiches! Slow Cook Taco Chicken is yummy! I like the kahlua pork. I also want to try the sweet potato turkey chili. That looks yummy too. i use the pepperoncini beef sandwich recipe all the time! We love pancakes so I think one of our favorites would have to be Pumpkin Roll Pancakes! I am looking forward to trying the chocolate cake recipe you posted recently! French dips, baby! So so good. We like the French dip sandwiches!! I haven’t tried any of your slow cooker recipes yet, but the slow cooker chocolate pudding cake is on my list! It looks so yummy! We are big french dip sandwich fans at our house. THANKS for the recipe! Taco chicken for sure is my favorite! LOVE LOVE LOVE the chicken enchilada soup. Looking forward to the temps dipping a lil lower in AZ to make some more yummy recipes! Thanks for this awesome giveaway! I love your soups – especially the black bean soup (that lime totally makes it!) and the white chicken chili. Pretty much all your recipes are yummy! The overnight breakfasts like oatmeal! I love the French dip sandwiches! Slow Cooker Taco Chicken is my fave Best Bites slow cooker recipe. My favorite is Chicken Enchilada Soup. I love soups, especially this one. Your sweet pork recipe is to die for! Taco Chicken, Pepperoncini Beef, soups, and pretty much EVERYTHING from OBB! I love your kahlua pork recipe! OBB french dip is our family’s fave! Kaluha pork is one of my family favorites. I love the Kalua Pork! We make tacos, sandwiches and salads with it! I love your slow cooker Kalua pork! Also, thank you for the chance to win! We just had pepperoncini beef sandwiches for dinner tonight! So yummy.